“In Session with Medical Alley” hopes to familiarize legislators and the Medical Alley community with each other. With our on-camera interviews, we learn how the health innovation and care industry can better partner with the legislature and find out fun facts you may not have known about the legislator. Last week, Medical Alley Association was in Washington D.C for the Biotechnology Innovation Organization (BIO) Legislative Day Fly-In. We met with BIO affiliates from all over the U.S to learn about the innovative work this industry is engaged in. 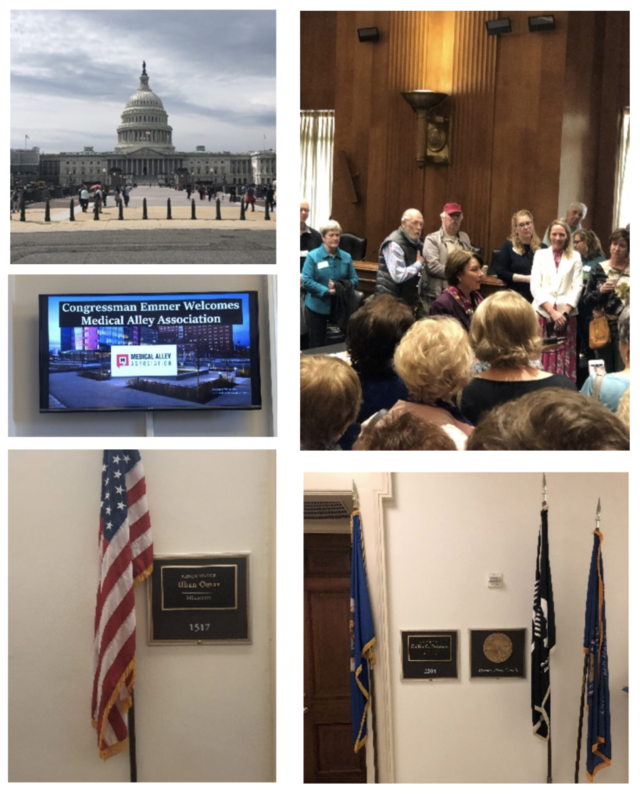 We had the opportunity to meet with the entire MN delegation to discuss BIO’s and MAA’s legislative priorities, as well as concerns pertaining to the biotechnology industry and its impact on Minnesota. The biotech industry has a competitive presence in Minnesota with 54,414 employees at an average wage of $98,761. This industry drives economic growth in Minnesota, which creates high-skill and high-wage jobs in health, energy and agriculture fields. All of which improve the quality of life both in the state and well outside of it. Our conversations were centered around the need to improve patients’ quality of life and access to affordable prescription medications without stifling innovation and how to keep companies in Minnesota. We appreciate our delegation for taking the time to discuss the importance of research innovation, workforce development, and the job-creating potential of biotech companies.  We appreciate their support for good public policy that accelerates life sciences, and biotech research and innovation in Medical Alley. 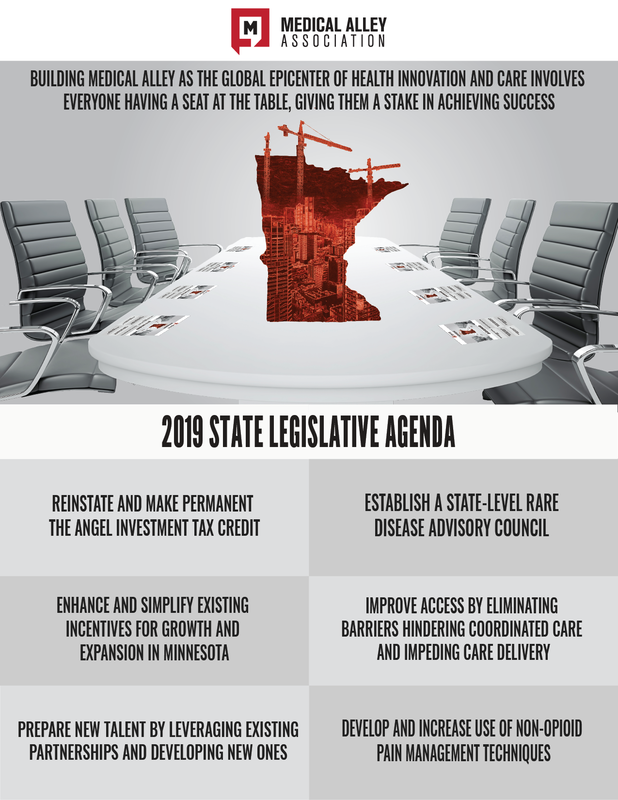 This past Wednesday, legislation that would reinstate the Angel Tax Credit received a hearing in the Senate Tax Committee. Senator Paul Anderson’s bill, Senate File 788, would fund up to $20 million in Angel Tax Credits each year, beginning in tax year 2019 (this year). This proposal is a key piece of Medical Alley Association’s 2019 State Legislative Agenda. Senator Anderson led off the hearing by laying out key facts about the Angel Tax Credit, including how from 2013 to 2017, more than $108 million was invested into 131 health technology companies using the Angel Tax Credit. One of these companies was POPS! Diabetes Care. The CEO of POPS, Lonny Stormo, testified about how the Angel Tax Credit was critical to attracting early investors to his company and enabling him to get his technology developed and off the ground. He also noted that, because Minnesota’s credit expired at the end of 2017, investment dollars have started flowing into neighboring states like Wisconsin instead of Minnesota. Following the testimony, the bill was laid over for possible inclusion in the Senate Omnibus Tax bill. Last week marked the beginning of an early-April tradition in St. Paul: the release of budget bills from each chamber of the Minnesota legislature. While there is still a long way to go before a final budget is enacted, these bills reflect the specific budget priorities of the majorities in the House and Senate. These bills need to fit within their respective targets that were announced in late March. For more on those, look back at the April 2 edition of At the Table. A detailed look at each of the bills and how they impact the Medical Alley community will be featured in an upcoming At the Table. We will keep you updated on both of these bills as they move through the process and are reconciled in conference committee. There will be a more detailed look at all the budget bills and their impact on the Medical Alley community in an upcoming edition of At the Table. Lilly’s legislative life headed east to Washington D.C for the BIO Fly-In last week, but have no fear, for Bobby was here covering all things state government-related. April 12th marks the third and final deadline: Committee chairs in both bodies have released their omnibus bills, held hearings to add amendments, and marked up the bill to meet deadlines. The week ahead will be full of committee hearings as bills will need to head to Finance and Ways and Means committees, with some bills needing an additional stop with the Tax committee. Once the bills meet the deadline on April 12th,members will go on legislative break for a week before coming back to long floor sessions to debate the bills. Those that survive the process will then head to conference committee. We will keep you up to date on what happens. See you next week!